Installing a tile backsplash using a self-adhesive mat, such as SimpleMat, is much faster and easier than using thin-set adhesive. Here’s how to go about it. Smooth Drywall: Remove any lumps or bumps from the drywall so that the surface is smooth. Clean Drywall: Clean the drywall to remove any grease or dirt and allow the surface to dry. Mark Surface: Mark the area to be covered, making sure the lines are plumb and level. Apply Adhesive Mat: Peel the backing from one side of the adhesive mat and stick it to the drywall flush with the lines. Adhere Adhesive Mat: Drag a rubber tile grout float across the mat to press the adhesive firmly into the drywall and remove any air bubbles. Apply Tile: Peel the backing from the front of the adhesive mat, and press the tile in place, cutting any tile as needed to fit. Use the rubber tile grout float to firmly press the tile into the adhesive mat. Apply Grout: Use the rubber grout float to apply grout to the joints between the tile. Use a damp sponge to remove any excess grout, and allow the grout to dry. The tile used were Jeffrey Court French Palace Stone Marble Mosaic Wall Tile (model# 99433). Watch this video to find out more. When you begin a tile backsplash using a self-adhesive mat, you must first remove any bumps from the drywall surface, then clean and dry it well. Mark the area to be covered, and peel the backing from the mat to apply it. The edges should be plumb and level which is hopefully parallel to adjacent cabinets, counters, and walls. Once it’s in place, pull a rubber grout float across it firmly to press the mat down and remove any air bubbles. Now you’re ready to remove the film from the mat and apply the tile. The pattern and spacing will depend on the specific tile that you use. When the tiles are in place you can use the grout float again to firmly press them into the mat. Because the adhesive doesn’t need to dry, you can apply your the grout immediately. Use the float and spread it across the surface at diagonals to the grout lines, as would on any tile project. Clean up the excess, and your project is complete. Hi, Vivian! We’ve seen homeowners use all kinds of materials for backsplashes. If the vinyl flooring matches your personal style, go for it! I have extra vinyl flooring that is not peel and stick ….Can I use the extra flooring for a back splase in back of my kitchen stove. This will match my floor……what do you think?? Thank you, hope to hear from you about this question…. SimpleMat is an excellent self-adhesive mat for applying a backsplash, as long as the tiles don’t weigh more than 7 pounds. 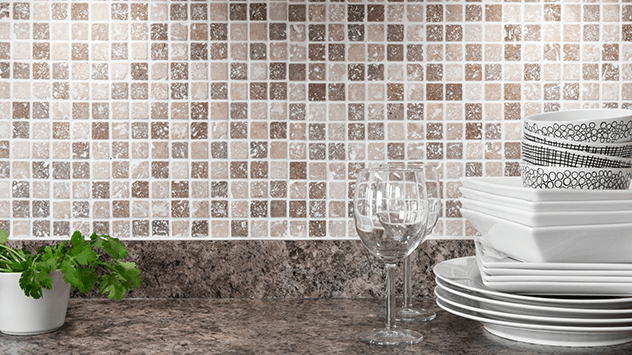 Behind the sink is a common location for a backsplash; just be careful with the water. i am looking for my Kitchen back splash done and i came across this simple mat to stick tiles ..is this advisable behing sink or any heavy water flow areas? if yes how long this mat can hold tiles stick to it? please advice if this is something lost long ? Is this suitable to be used above a tub/shower insert? Was wondering if the humidity from the hot water would make it drop off the wall. Danny says, “Great idea! But I really don’t think you will be successful in matching the color of the tile. You might consider either looking extensively for a tile store or home center for a piece of tile that will match as close as you can get, or take the opposite approach and go with something completely different. Then potentially remove other tiles and put random tiles in that are completely different. Hi Ben. I have a dilemma . In my main bathroom,I had to have the tub fixtures replaced as they were seized from not being used for about 15 years. When the plumber was trying to remove the guts of the fixtures, he had to cut out some of the wallboard in the hall to get access to them. In the process,the vibration of the saw knocked 1 of the tiles (behind the tap ) off the wall and into the tub and it broke into 3or 4 pieces. I can’t find a replacement tile as they are about 40 years old. I bought a clear glass mosaic tile as an accent replacement. What I’m wondering is, can I add a pigment to the tile adhesive to mimic the butterscotch colour of the surrounding tiles so it will show through the clear glass so the replacement tile won’t stick out like a sore thumb and hopefully blend in with the rest of the tiles. 3 yrs ago I used simplemat to tile over 30 yr old laminate. Our kitchen counter top had square edges and laminate sheets used as back splash. I used simplemat and tiled right over the laminate. I used small glass and marble netted 12×12 sheets on back splash and large marble 12 x 12 tile on the countertop. It has held up great. It was quick and easy. It looks great and I will use it again. P.s. old school mastic would not stick to the laminate. Hello, can this self-adhesive mat or self-adhesive tiles be applied to existing ceramic tiles.? The self-adhesive tile mat we used is called SimpleMat. It’s made by Custom Building Products and is available at The Home Depot. Please could you supply me a name of the company that stock the adhesive mat, we don’t have anything like this in South Africa. Looks nice, but why no information about the fact that you’ve had to cut a bunch of half “tiles” to fit on both sides of the edges? How did you do that? What issues did you run into? The tile installed were Jeffrey Court French Palace Stone Marble Mosaic Wall Tile (model# 99433). I added it to the article above as well.